2018 was not a great year for the stock market. There were very few safe places to hide, with most stock markets around the world posting double digit losses. In Canada, small cap stocks were hit particularly hard. The TSX small cap index sunk into bear market territory with a loss of 20% for the year. The US markets remained relatively more buoyant for much of the year as Trump’s tax cuts goosed corporate profits and made year over year comparisons look quite rosy. But even the US markets couldn’t withstand the growing global gloom forever and started to catch down to the rest of the world by year’s end. When the dust settled, the Russell 2000 Total Return index ended the year down 12% from where it began. In the face of all this red ink, my portfolio managed to hold its own reasonably well, ending the year with a loss of 5%. And my trailing 5 year performance remains solid. I’ve managed to beat the Russell 2000 Total Return Index by an average of 10.5% per year over the past 5 years. It certainly could have been worse. Multiple mishaps and nasty surprises threatened to derail the portfolio at several points during the year. Assure Holdings offered the first unpleasant surprise as I awoke one morning to discover that their auditors had resigned and the stock had been halted on rumours of financial impropriety. It took a very painful 5 months to finally sort out the whole mess. New accountants were hired, new management took over and the stock eventually began trading again, although investors remain skeptical and the stock price has so far failed to recover from the damage that had been inflicted on it. In late summer, Questor got blind-sided by a ballot initiative in Colorado which would have effectively banned the majority of new oil and gas drilling in the state. Given that the vast majority of their revenues came from this state, the stock price reacted quickly, dropping by 50% from its high of a few months earlier. Westjet also offered up an unpleasant surprise as it posted its first quarterly loss in well over a decade, a result of sharply rising fuel costs and an aggressive capacity expansion in the face of intensifying domestic competition. 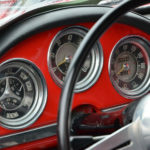 Meanwhile, my two auto parts companies were under pressure as investors grew increasingly concerned about the possibility of a serious global slowdown in the auto sector. Geodrill was hit with a money grab from the Burkina Faso government as withholding taxes in that country were boosted to punishing levels. And Essential Energy Services was hit particularly hard by an increasingly bleak outlook for the Canadian oil and gas sector. Finally, an attempt to cash in on the retail apocalypse south of the border proved to be premature as Big Lots succumbed to the general malaise in the sector and reported a string of disappointing quarterly numbers. Still in all, the year was not without its high points. Viemed healthcare was a definite win. I bought this supplier of home ventilation services back in March and sold it for a quick 50%+ profit 5 months later. Macro Enterprises also performed well. After years of false starts, construction finally started on western Canada’s first LNG terminal in Kitimat. This facility promises to be one of Canada’s largest-ever infrastructure projects when it is finished. Macro obtained the go-ahead to start construction on the coastal link pipeline that will feed gas from northern BC into this new terminal and this should give a healthy glow to profits over the coming quarters. Phoenix Energy Services is showing promise as it moved into profitability in the latest quarter. They have been building up their fleet of modern drilling rigs and mud motors and are looking forward to a more robust 2019 as they continue to concentrate on the booming US market. 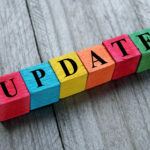 After a nail-biting few months, oil and gas drillers in Colorado got the green light from voters to continue to drill for new oil and gas supplies and Questor Technology is back in investor’s good books. The outlook for next year is strong as they continue to build out their rental fleet of incinerators and expand into other states. Linamar has enjoyed a very good year as strength in its scissor lift division and new farm equipment division helped to offset some weakness in the auto parts segment. Magna also posted record earnings. Assure Holdings is growing like gangbusters as it continues to expand its neuromonitoring operations into new states and Cervus Equipment is posting its best results in 6 years on the back of strong demand from its agricultural customers and increasing profits at its truck division. There wasn’t much turnover in the portfolio this year. A steady drift downward in the prices of Canadian small caps didn’t offer up much opportunity to exit my undervalued positions at attractive prices. For the most part, my cheap stocks just got cheaper! I did manage to take profits in two stocks at the very beginning of the year. Supremex was a value-priced envelope manufacturer. They have been trying to pivot away from their legacy envelope business into the more promising packaging sector. However, they have been fueling this turnaround with debt and it was looking as if the envelope business was sinking faster than they could grow the packaging side of their business. I exited this position but am open to renewing it in the future if the pendulum starts to swing back in their favour. Another stock that I sold early in the year did, in fact, find its way back into the portfolio at a significantly reduced price. Gluskin Sheff is a repeat customer in the portfolio and at the new, low, low price of $10, I am liking the looks of this stock again. I sold off a small holding in Difference Capital as I did not want to hold on to this speculative position through the next recession. For similar reasons, I sold off my position in Atlas Engineered Products this fall. While I still love the story at this roll-up attempt in the building truss market, I grew leery of their continued losses and mounting debt and wondered if they had time to build enough scale before the next recession hits. With house prices in Canada as over-extended as they are, the next downturn could be a bad one for home builders and Atlas Engineered lacks a long enough public track record to leave me confidant in their ability to weather the coming storm. I will watch this closely though, for a possible future re-entry point. All things considered, it is a wonder that the portfolio held up as well as it did. Certainly, my hedging activity, using put options on the S&P 500 helped, although it wasn’t until the last couple of months of the year that these started paying off. The first 9 months were unpleasant, as my Canadian small cap stocks struggled to hold their own while my put options, which were supposed to be protecting me from declines, were doing anything but as US stock prices continued to soar to new heights. 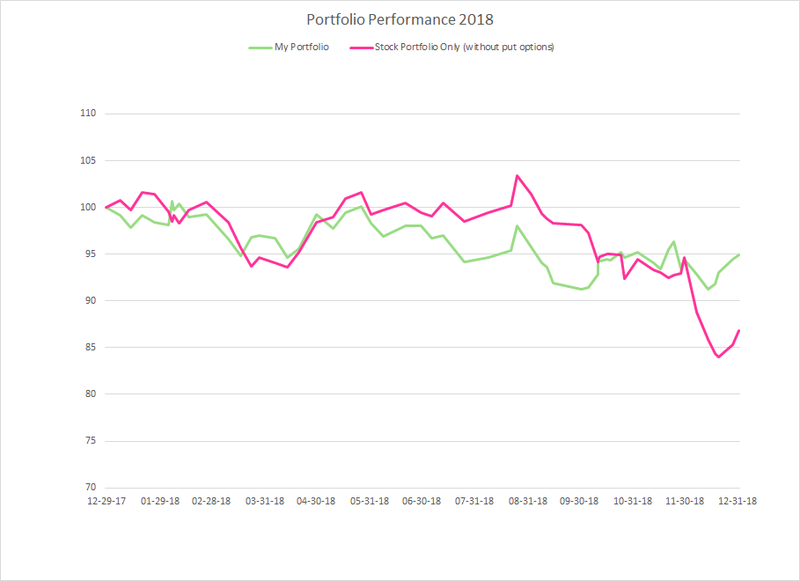 Below is a graph of my portfolio performance over the year, both with and without the contribution of those S&P 500 put options. In the fall, as the US markets peaked and then began to roll over, these put options finally began to pay their way and took some of the sting out of the precipitous drop in stock prices in December. 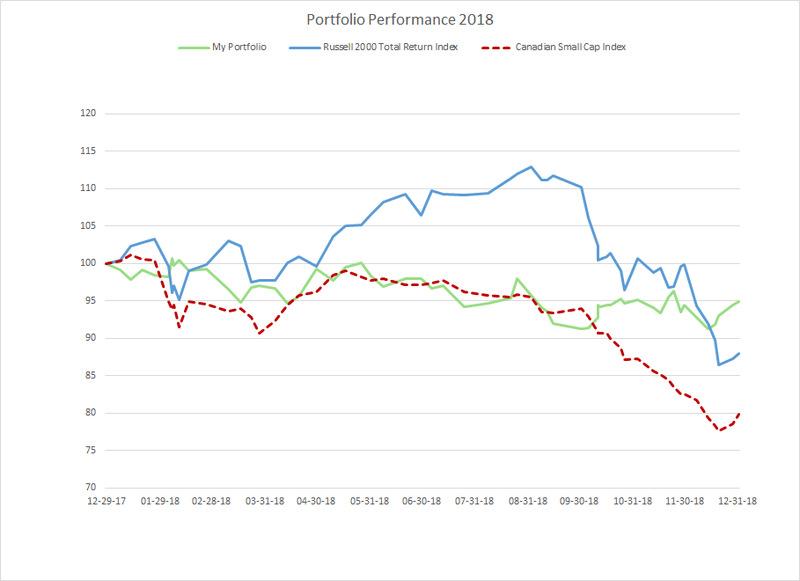 Without the put options, my portfolio would have been down 13%, underperforming the Russell 2000 by about 1% (although outperforming the Canadian small cap index). I am hopeful that comparisons might be easier in 2019. The corporate tax cuts in the US have largely worked their way through the system by now. Going forward, 2019 results won’t get the same boost as they did last year which will hopefully mean that Canadian and US stocks track each other a little more closely. As well, oil prices took a nosedive towards the end of the year and this, together with brutal take-away capacity constraints in the western oil fields knocked the stuffing out of Canadian oil and gas stocks and weighed on the many Canadian companies whose fortunes are indirectly tied to the oil and gas industry. Perhaps most of the bad news in this regard has now been priced into the Canadian small cap market and this will be less of a headwind as we move into 2019. On an individual basis, I am enthusiastic about many of the stocks I currently hold in the portfolio. On a relative basis, I think they offer wonderful value and given the right environment, could significantly outperform. The price to earnings and price to book ratios of my portfolio stocks are substantially lower than the market as a whole and the balance sheets are significantly stronger, with much lower average debt ratios. This fall I did a very thorough investigation of the Canadian market and spent a fair amount of time combing through the cheapest stocks I could find in the US as well and am satisfied that the stocks I currently own are among the cheapest of what’s on offer. Over time, I am hopeful that this will drive strong relative performance, as it often has done in the past. However, I remain nervous about the overall direction of the market. And while I will try hard to swim against the tide with rigorous value-oriented stock selection, just as a rising tide lifts all boats, when the tide goes out it is very difficult to make any forward progress. Until I see signs to the contrary, I continue to believe that the tide is still on its way out. 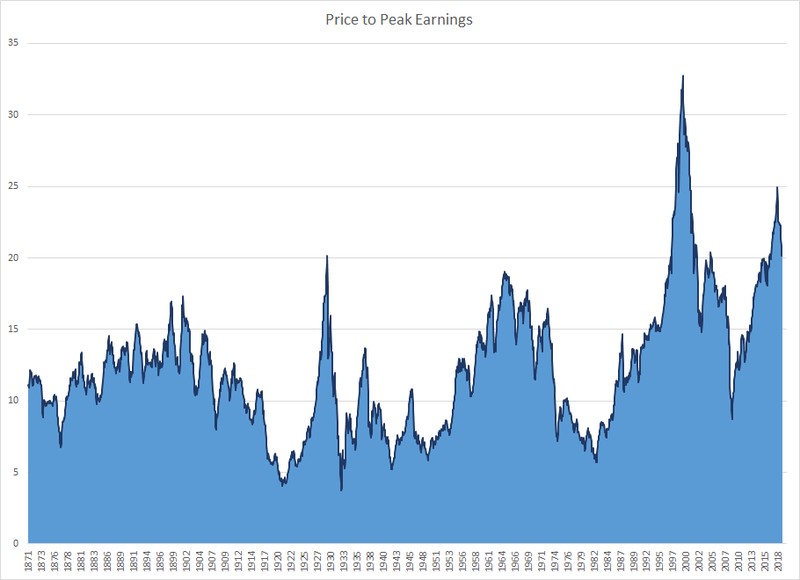 Below is an updated graph of the price to earnings ratio of the market (using the highest earnings level obtained over the preceding 10 years). While valuations seem to have passed their peak, as the market topped out in 2018, there is still plenty of room for these valuations to move lower. 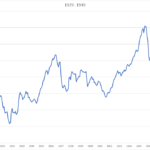 When measured against the underlying earnings, stock prices reached quite frothy levels in 2018; levels only seen three times before, in 1929, 1964 and 2000. A similar picture emerges when comparing stock prices to sales, book value or GDP. Combined with evidence that we are getting close to the end of this business cycle (record low unemployment, flattening yield curves, record debt levels) it suggests a fairly dire outlook for stock prices going forward. What concerns me most and is primarily the reason that I have gone to the unusual (for me) lengths of establishing an expensive hedging program for my own portfolio, is the possibility of a double-barreled assault on stock prices caused by plummeting p:e ratios on the one hand and declining profit margins on the other. Below is a graph of average corporate profit margins over time. At the same time as stock prices relative to earnings are at historic highs, profit margins are also at historically high levels. Profits have been boosted by globalization, as companies offshore expensive manufacturing operations to low cost locales, by record low interest rates which have enabled companies to borrow vast amounts at very attractive terms and by the recent tax cuts in the US. All of these factors could go into reverse. Trade tariffs could reverse the decades-long trend towards offshoring, central banks have started to raise interest rates and tighten up their balance sheets and those US tax cuts could get competed away. If p:e ratios were to drop by 3/4 from the high end of their historic range to the low end at the same time as profit margins reverted to more moderate levels, the end result would be a stock market that could ultimately lose 80% or more of its value as it did in 1929. An 80% loss is hard to recover from and is why I am remaining hedged using my admittedly imperfect vehicle of put options on the S&P 500 and why I’ve suggested to many of my friends that they keep a large part of their portfolio in cash to guard against this sort of extreme market meltdown. At the same time, while the possibility of a great depression style wipe-out has to be entertained, it hopefully does not represent the most likely outcome. After all, there are a lot of positives to give one a cheerier outlook. Main street has not shown the same kind of excesses as it has in past booms. The recovery from the Great Financial Crisis was long and slow and only recently has the economy really started to show significant signs of strength. There could still be a couple of years left in this economic engine. The baby boomers are all hitting retirement age and while that means they will be starting to spend down their prodigious collective savings, studies have shown that they are likely to do this only very slowly over time. The record low interest rate environment that businesses and consumers have gotten used to may persist for many more years as that pool of savings continues to provide cheap and ready financing for anyone who wants it. It may also help to prop up stock prices and keep valuations high. 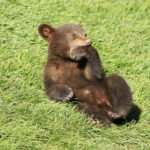 I’ve yet to see the kind of mouth-wateringly good deals that were offered up at the bottom of the market in early 2009, but if this bear market continues to lumber its way down Wall Street, they will start to appear. I took a look at a dozen or so companies in the blockchain sector this fall, looking for value amidst the wreckage but did not come up with anything. There are a number of companies in this space that are now trading well below their tangible book value but that book value is comprised of mining rigs which may not actually have any residual value. This point was made very clear by images from China showing bitcoin mining rigs being carted out in wheelbarrows and unceremoniously dumped into piles on the sidewalk. I’ve also been looking hard at other beaten down sectors including semiconductors, home builders and retailers but am constantly reminding myself of the adage, “don’t shoot until you see the white’s of their eyes.” I believe better values are on the way. So while my crystal ball remains cloudy and I nervously anticipate a further market drop, I see glimmers of hope. On a relative basis, I am keen on the stocks that I own in the portfolio right now. While I can imagine them getting cheaper (possibly much cheaper) and while there are obvious risks inherent in all of them, they are more attractively priced than many of the other stocks out there and in the right situation, could perform very well. 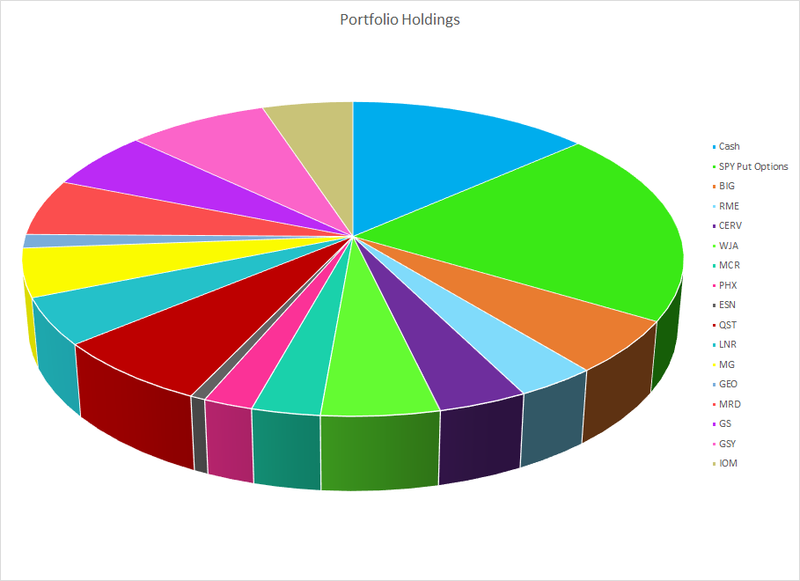 Percentage of total portfolio. Legend reads clockwise from top. Assure Holdings is a company based out of Colorado that managed to find its way onto the Canadian exchanges. The company offers neuro-monitoring services to surgeons. If the surgeon starts to cut into a nerve during an operation, the technologists running Assure’s machines can alert the doctor before irreparable harm is done. The company is reporting strong earnings and has exciting growth potential as it pursues expansion into states outside their home turf in Colorado. 2018 was a difficult year as the founder of the company used the company credit card a little too liberally for his own personal expenses. Trading was halted for five months as new auditors and new management were brought in. The company appears to be back on track, with exciting growth potential as they continue to roll out their services into new states and new surgical applications. Lingering doubts remain about the ability of the company to fully collect on its billings, but recent results have been encouraging in this regard. Even assuming that a significant proportion of billings will ultimately be uncollectable, the strong growth prospects and the low valuation make this a compelling story. Big Lots has over 1400 stores spread across the United States, selling a variety of goods from furniture to food and consumables to seasonal products. They specialise in closeout and discount merchandise. For the past 10 years, their strategy has been to keep their store footprint stable and recycle any excess profits they have into buying back their shares on the public market. As a result, even though sales and earnings have stayed relatively flat on an absolute basis, their per share numbers have shown healthy growth. Results this year have disappointed, though, as they have fallen prey to the “retail apocalypse” that has been sweeping the sector. However, they remain solidly profitable and as a down-market retailer, my hope is that they might exhibit some resiliency if we are headed for a recession, as they did during the last economic downturn. At the current price of $27.10, the stock is trading at a very reasonable 8 times my reduced earnings expectations for this year of $3.50. Cervus operates a chain of farm equipment dealerships spread across western Canada. They also own a similar chain in Australia and New Zealand. Additionally, they operate a trucking division in Ontario which sells Peterbilt trucks. A binge of farm equipment buying in the early 2010’s led to a hangover that lasted several years and dragged down sales and profitability in the sector. Conditions seem to be returning to normal again, though and the company is back in growth mode. 2018 saw near record-high profits on the back of strong equipment demand in both the agricultural and trucking sectors. With a trailing p:e of 8.5 at the current share price of $12.75, this stock looks to me to offer good value in an otherwise expensive market. This company owns and operates a fleet of oil and gas drilling rigs in western Canada. They were hit hard when the price of oil collapsed in 2015 but were making progress towards a recovery in 2018, posting results that were close to breakeven. However, a combination of renewed weakness in the price of oil and a punishing discount for western Canadian crude because of a lack of pipeline capacity to get the oil out of the province has pushed the stock price down to new lows. While the outlook for the Canadian oil and gas industry is looking fairly bleak at the moment, the pessimism in the sector has meant that the stock is now trading at a mere one third of its tangible book value and just a little over 1 times its previous peak earnings. If you ignore the significant depreciation expense of its sizable rig fleet, it is cash flow positive and has a relatively modest debt level. Risk in this investment is high given the uncertain future of the industry but there is substantial turnaround potential if they can survive the storm. I have sold off some of my holdings in this stock and retain only a small position. Geodrill offers contract drilling services to miners in western Africa. They have been actively trying to diversify their customer base into base metals and potash but most of their business is still with the gold mining industry. They were recovering well from the industry slump of the last few years and appeared to be back in growth mode earlier this year. Then the rug was pulled out from underneath them as Burkina Faso, where they do a large percentage of their business, decided to double its withholding tax rate. These withholding taxes are based on a percentage of revenue and not profit which means that any weakness in operations have an outsized impact on after-tax profitability. This is exactly what transpired in the most recent quarter and it sent the stock price tumbling. I have been attempting to exit this position but am unwilling to simply give the stock away. At the current share price, the company is trading at around 1 times its tangible book value. Management has been guiding to improved results in coming quarters and if they can divert more of their business into lower tax jurisdictions, profitability could improve. Gluskin Sheff is one of Canada’s leading independent wealth management firms. They primarily target high net worth individuals and have a long track record of consistent investment outperformance. Over the years they have paid out the majority of their earnings to shareholders in the form of regular and special dividends. Results can be lumpy year to year as they earn sporadic performance bonuses depending on the relative performance of their funds under management. The stock price has been in a deep dive as investors worry about a change in top management and a possible market downturn. Looking out longer-term, though, the low p:e of 8.5 to trailing earnings and the company’s strong long-term track record I believe makes this a worthy addition to the portfolio. This is what Peter Lynch would call a GARP stock. (Growth at a Reasonable Price) By my calculations the stock is trading at a p:e of around 10 to earnings that have doubled in the past 3 years. They started out life operating a chain of rent-to-own stores that would rent out TVs, sofas, appliances, etc. to customers who didn’t want to purchase the goods outright. In running this business, they saw a need among their customers for credit that wasn’t being met by the big banks. They saw a window to position themselves between the somewhat predatory payday loan stores and the disinterested, larger banks and to this end, they have been aggressively rolling out their Easy Financial network over the last few years. Revenues and earnings have been soaring and the company still sees room for plenty of growth. They are expanding their network into the province of Quebec, they are adding new customers to their existing outlets and they are adding new products to their growing suite of financial services. The stock was hit this fall by a short seller’s report that raised concerns about the possibility of new legislation that might regulate the fees and interest rates that they can charge as well as concerns over the quality of their loan book and whether or not they are provisioning properly for loan losses. While these are certainly legitimate concerns, the valuation is low enough and the outlook is sufficiently appealing that I remain fully invested. Linamar is a $5 billion, large cap company with a spectacular track record of growth. EPS have grown by a factor of 4 since their previous peak at the end of the last business cycle in 2007. Currently trading at a p:e of only 5 to trailing earnings, this stock looks very cheap on the surface, especially considering its size and track record. However, investors are justifiably nervous about the auto sector in general. Car companies have been aggressively pushing out longer term loans and consumers may find themselves tapped out soon enough. Auto sales at the big car makers are starting to slide. The resolution of the NAFTA negotiations still leaves some unanswered questions. And the electric car bogeyman is out there on the horizon, threatening to put an end to the internal combustion engine. But all that nervousness has created a good buying opportunity, I believe. Linamar is actively positioning itself to win business in the emerging, electric car industry and they are also diversifying into other sectors. They already have a very successful division that manufactures scissor lifts. To this, they recently added a large acquisition in the farming equipment space. 50% of their profits now come from outside the automotive sector. With these moves, my hope is that there is plenty of opportunity for Linamar to continue to thrive and grow in the coming years. Macro Enterprises is a feast or famine type of company. During the periodic industry busts, they tend to lose money, but during the boom times, they can make out like bandits. The company offers pipeline construction services to companies in the Canadian oil and gas sector. Canada is desperately in need of more pipelines. Canadian crude has been selling at a deep discount to the US version because there is no good way to get this crude to market. Shipping it out by train doesn’t really cut it anymore with the vast quantities of cheap shale oil that the US is pumping out of the ground. Macro has signed a large contract to work on the Trans Mountain pipeline out to the west coast but the future of this project is uncertain as construction has been delayed by environmental concerns. The Canadian government has taken ownership of this project, but it still faces fierce opposition. Environmentalists are fighting tooth and nail to prevent any new pipelines from being built and they may well emerge victorious. However, Macro recently got some very good news as LNG Canada announced they were moving ahead with their proposed new LNG plant on Canada’s west coast. Macro has a large contract to build a pipeline from northern BC to supply this plant and this should keep the money rolling in well into 2019. Beyond that, a thriving LNG plant could drive a renewed spurt of activity in Canada’s gas patch that could mean more business for Macro down the road. Magna is one of the biggest bruisers in the Canadian market, with a market cap of $20 billion and operations spread across the globe. They have factories in China, Europe, the US, Mexico and Canada making a wide variety of auto parts for a wide cross section of automakers. The metrics look good with a trailing p:e of 7 and debt that is only 2 times earnings, but investors just aren’t interested. Valuations are low across the industry. Like Linamar, Magna sees lots of potential in the evolving electric car space. With auto makers committed to launching dozens of new electric models over the next few years, Magna is sure to win a chunk of this new business as it did when it won the contract to build the new iPace for Jaguar. As well, they have been actively pouring money and resources into developing autonomous driving systems and if you can believe the string of news releases, have been making strong headway in this exciting new area. They had a record year in 2017 to cap off an impressive 4 year run with returns on equity well into the 20% range and earnings continued to reach new heights in 2018. Profit margins have also been impressively high. Compared to their performance during the last business cycle, they are really firing on all cylinders. While this is great news, it is also merely what we see in the rearview mirror. Looking out the front windshield, the road ahead does not look so clear. There have been reports of sliding auto sales in the news recently and investors are taking a very dim view of the whole auto industry. An investment in this company could require a deal of patience as we may have to whether a severe downturn before things perk up again, but at the current share price, I am willing to wait out the worst of the storm. Melcor is a property developer based out of Calgary. They got side-swiped by the downturn in the oil patch and the stock still has not recovered. You can pick it up now for half the net value of their property holdings (a lot of which is raw land that they are holding to develop). They have been solidly profitable for the past 16 years (which is as far back as I’ve looked) and have been in the business for decades. Their business model is to buy up undeveloped acreage, put in the roads, sewers and whatnot and then sell completed lots off to builders. They typically keep some of the prime land to develop into big box plazas and then keep some of the resulting retail and office space and stuff it into their pet REIT or hang on to it themselves and harvest the rental income. The Canadian housing market may be a bubble looking for a pin but Calgary, at least, doesn’t have the million dollar crack shacks that Vancouver does. These guys have been around the block quite a few times so I am okay with backing this horse despite the risk of a housing bust 2.0. PHX Energy Services is a contract driller with a nicely diversified geographic base. 60% of revenues are coming out of the US right now where the frackers are on fire, along with another 7% or so from Russia. The remainder is back in Canada. PHX has been working on a number of proprietary technologies which could give a strong boost to future growth and profitability if they can drive adoption. To my understanding, these new technologies mostly center around the automation of the drilling process, meaning fewer oil hands needed. With a shortage of skilled oilfield workers and a relentless focus in the industry on cutting expenses to the bone, I could see potentially big demand going forward for these kinds of solutions. The latest third quarter results were encouraging as the company moved to profitability after a long string of losses. The company is reporting strong demand for its new rigs and continues to invest in new equipment, most recently announcing the establishment of a high-performance drilling motor division. Their balance sheet is strong and they are trading for less than their tangible book value. While the price of oil has taken a deep slide since the third quarter results were released, if they can deliver on the promise of their new drilling systems, they could still turn out to be a big winner. An oil and gas services company with a technological twist. Questor rents out a fleet of waste gas incinerator units that it developed itself to oil and gas companies to reduce their methane emissions. They have done extraordinarily well in the past year in Colorado where the state legislature passed tough environmental standard laws mandating the use of technologies like Questor’s. They continue to expand their rental fleet and say that other states are now considering adopting similar environmental legislation which would help drive continued growth and expansion. In a surprising upset to their well-laid plans though, an environmental group managed to get a new initiative onto the ballot for the November 6th elections, proposing what essentially amounted to a ban on all new drilling in the state of Colorado. This proposal was ultimately voted down and the stock price has since partially recovered but it highlights the need for the company to search out expansion opportunities outside the state of Colorado. Recent developments are encouraging in this regard. They are mobilising 10% of their fleet into North Dakota in 2019 and have also been getting enquiries from operators in the Permian basin in Texas. The share price is a reasonable 12 times trailing earnings given the potential for continued growth as environmental standards in other states are toughened and they expand their rental fleet. However, they were heavily reliant on a single customer in 2018 and in 2019, they face the expiration of some of their major patents, so the stock is not without its risks. A recent slide in the price of oil could have additional negative ramifications. It is worth keeping a close eye on future developments. Rocky Mountain owns and operates a chain of farm equipment dealerships in western Canada. This industry has apparently been through a dry spell over the last few years. Sales and earnings slumped at RME and there was some excess inventory that they had to work through. But things are back on track now. Inventory levels are down and profits are picking up. Hopefully, this momentum will continue. Historically this has been a strong performer through all the phases of the business cycle as their results are affected more by weather patterns than by economic activity. People can put off buying the latest iGadget but they are always going to want food on their plates come suppertime. Right now, that sort of more defensive play is looking attractive. And at a trailing p:e of 9 and a p:b of 1, you don’t seem to be paying a significant premium for this sort of stability. Westjet has big ambitions. They have launched a new, ultra low-cost carrier this year and have been expanding their international flights. They have a long history of profitable growth and strong execution behind them and hopefully this past success will translate into future results as they move into the next phase of their growth. Shorter term, though, they are going through some fairly severe growing pains. They have taken on a bit more debt than I like to see to fuel their expansion plans and this, along with the recent spike in the price of oil and a growing list of competitive threats from other low-cost carriers has put a serious crimp on their profitability. The company lost money in the second quarter of this year for the first time in well over a decade. This has knocked the stuffing out of the stock price and WestJet shares are now trading at a price of only 6 times their peak earnings of a few years ago. 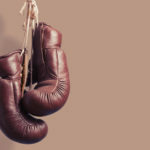 A belief in their ability to work through their growing pains and emerge stronger on the other side could pay off handsomely if in fact they do manage to turn their operations around. To help cushion the blow from a major market downturn, I have bought a significant number of put options on the SPY ETF which closely tracks the performance of the S&P 500. These put options have a strike price of 315 (equivalent to 3150 on the S&P 500) and expire Dec 20, 2019. They give me the right, but not the obligation, to sell SPY units at 315 on that date. If SPY is trading significantly below that price on that date I could theoretically buy the SPY units at the existing price and turn around and sell them at 315, making a profit in the process. In practice, however, this is not really feasible as I would need a large chunk of cash set aside to make the initial purchase. So in practice, I would be much more likely to sell the options themselves prior to the exercise date. The options are heavily traded and can be sold at any time. Generally speaking, as the S&P 500 declines in value, the value of the put options should rise, thus hopefully providing some offset to the decline in the value of my long positions in individual stocks. Full Disclosure: I own shares in Assure Holdings, Big Lots, Cervus Equipment, Essential Energy Services, Geodrill, Gluskin Sheff, GoEasy, Linamar, Macro Enterprises, Magna International, Melcor Developments, PHX Energy Services, Questor Technology, Rocky Mountain Dealerships and WestJet. I also own put options on SPY.